Commissioned by The Grand Opera House, Belfast. ACT II development, entrance to the Baby Grand Studio Theatre. 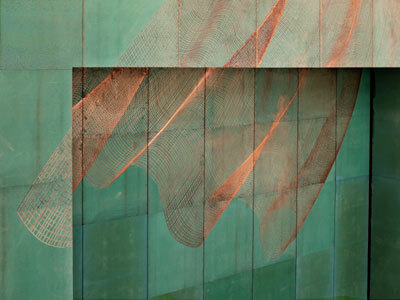 8.4 x 5.7 meter engraving into patinated copper. The curtain is an icon of the theatre, it marks the line between the real world and one in which we may choose to believe. Thinly Veiled takes the traditional image of the curtain and transposes it through computer animation to produce a wireframe model of billowing cloth. The final image is a freeze-frame moment of the curtain caught between opening and closing, suspended in time as it sweeps across the threshold. Funded by the Arts Council of Northern Ireland. Engraving - Hitchens and Co.